I got this sample in the mail a few days ago, because I am obsessed with samples. I see a sample, I want the sample. I can't be stopped. So when I saw this as an option through TOPBOX, it was pretty much "Signed, sealed, delivered. I'm yours." It turns out this "sample" size is actually the same size as the travel version offered at Sephora for $14 CA, though the size seems to only be offered in two colors at the moment- Revved-Up Red and Lusty Rose. Not bad for a so-called sample and FREE! They shipped out two different variants to those that requested the sample- this Pink Thrills version and the Lusty Rose shade. 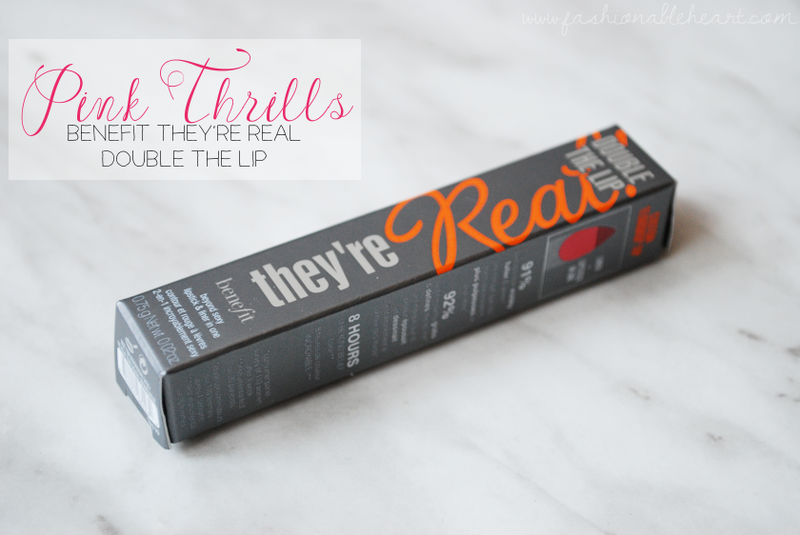 Here are my thoughts on the Benefit They're Real Double the Lip Lipstick and Liner in One. It turns at the base to bring up the product. I say this, because I tried to turn the top part first. Maybe that's just me (probably!). The smell is a little off. I can't place my fingers on it, midway between fruit and plastic. It's not bad, but it isn't good either. The lid has a nice snap, so I think it can be travel-friendly. Benefit describes the shade as a real pink. Yeah, I agree with that. Both the liner and lipstick tips swatch a little more vibrantly than they look on the lips. It looks like quite a contrast, but it isn't once it is on the lips. I will say it is easier to apply to the top lip, because it just feels strange in the hands when you flip it upside down for the bottom lip. 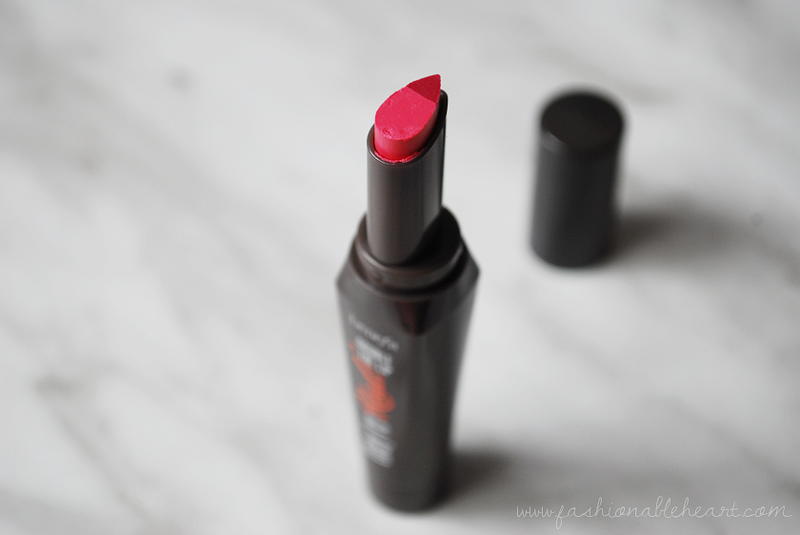 The color of the lipstick is lovely and the formula does not feel drying. I thought it was a bit gimmicky at first, but it does line and fill in the lips quite easily. 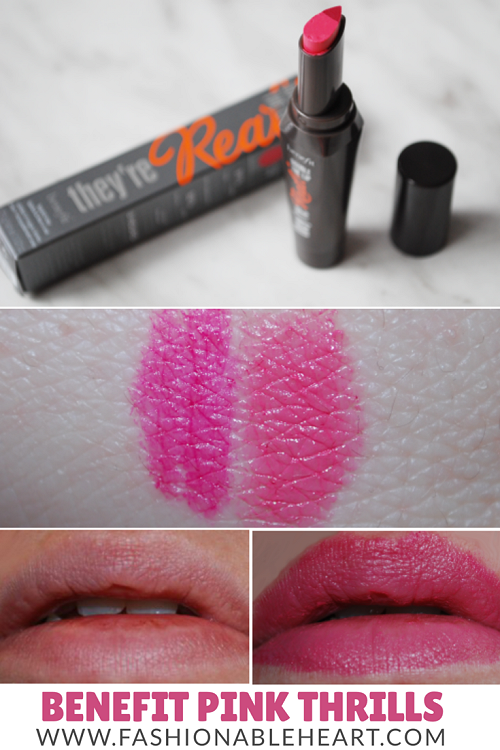 I get a few hours of wear with this, but I find better staying power with other lip liners. Not bad for a one stop shop, though. I don't really think they are worth the $26 CA price at Sephora, but it could be worth it if you purchase one during one of Sephora's VIB sales.